After specifying the Column Header(s), Row Header(s), and *Tabbed Data, additional options that control how the Crosstab Report is generated can be specified. •Separate tabbed columns: Puts each of the tabbed values into a separate column. This is useful to visually distinguish the values or do further sorting or analysis of the final report. •Combine tabbed columns: Combines all of the tabbed values into a single column using the specified format. Customize the format as desired using curly brackets and column numbers (starting at zero) to indicate the values from each of the tabbed columns. •Separate tables by each unique: Allows for the simple creation of a separate Crosstab Report for each unique value in the selected field. For example, to create a separate report for each different location, select SYS_LOC_CODE. •Limit columns per page to: Allows for a limited number of columns per page. This is very useful when converting to a .pdf or when printing. 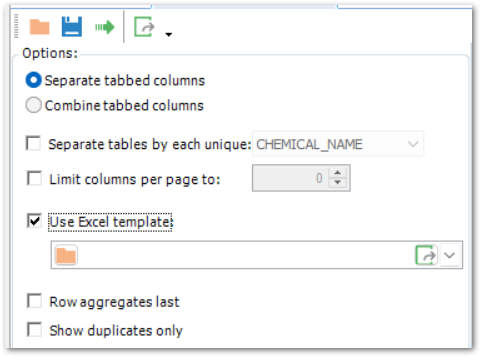 •Use Excel Template: Associate different parts of the template to the tabbed data, column header, and row header sections of the Crosstab. •Row aggregates last: If Row Aggregates are used, checking this box will display the Row Aggregates columns at the end of the Crosstab output, rather than in the row headers. •Show duplicates only: Checking this option only shows duplicate values. This option can be used to quickly find any duplicate data in the Crosstab. Click here to view an EQuIS Academy recording about Crosstab Reports. The default value is False, so if the appSetting does not exist, only numeric columns will be exported as numbers. If the appSetting exists and is True, all numeric values will be exported as numbers, regardless of the data type of the column. If working with a large set of data or if exporting to Excel is very slow, the steps below are strongly suggested. 1.Turn XlsForceStyle off by adding the line below into the EQuIS.exe.config, appSettings section. 3.Add cell borders and/or any other formats manually in Excel (e.g. select all worksheets first, and add cell border lines that will apply to all worksheets of one operation) if necessary.